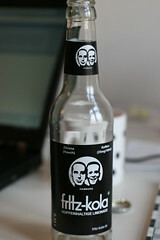 Here's a shot of some fritz-kola, which I just finished enjoying. Good business. Man, I'll be leaving Berlin this Monday. It's been fun, and I've even gotten some work done, which is really good because I have this deadline coming up in December... Anyway, what have we learned? - I learned that autotuner has finally made it to Germany. - Most German beer is very similar. That being said, Schultheiss was my favorite, and since you can't find it everywhere, Jever will do as well. - Donner is delicious. But I already knew that. - The "Wallpaper*" series of guide books is kind of pretentious and lacks good maps, but being able to fit the book in my pocket makes up for any shortcomings. This week I went to an English bookstore called St. George's and got a few books for the way home. One, "Goodbye to Berlin," I have almost finished. It's pretty good. It was the basis (indirectly) for the musical Cabaret. The other one, "Berlin Alexanderplatz" I haven't started yet. Did you know that Bruce Dickinson, lead singer of Iron Maiden, is a commercial airline pilot? In fact, he hosts a show about airplanes on Discovery Channel called, "Flying Heavy Metal," and I've been watching it on YouTube. Awesome. I guess I never mentioned this because of how hectic things were the last two weeks, but I did participate in the OOPSLA 2009 Student Research Competition. The first day, I presented my poster in an all-conference poster session. Owing to the excellent position of my poster (Yay for alphabetically-early last names!) I talked to a ton of people, thus giving me the necessary confidence for when the actual judges came to talk to me. That night, I had a message in my hotel room that I had passed on to the final round, meaning I needed to give a short presentation explaining my work. Of course I didn't have one, so I wrote one there in the conference. The results, were pretty good. I think I gave a good talk. My slides were fine. I definitely could have answered the questions better. Nonetheless, I won third place, which amazingly means I will receive a plaque and a small monetary prize. Tudo Dumitraş, another CMU student from a different research group, won first prize. Therefore, from this point forward, I shall refer to my thesis work as award-winning research. 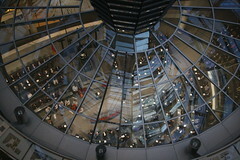 My first day of site-seeing in Berlin, and it was a doozy! We started off in Alexanderplatz*, which is sort of the center of East Berlin. They have they crazy TV Tower that looks like Sputnik on a pole. We walked around that whole area, which has a number of neat shops**, wide streets and was filled with people. The weather was sunny today, for the first time that I've been here, but it was still pretty cold. We saw a couple neat art exhibitions. The first was Scorpio's Garden, which was just a sort of temporary gallery of contemporary art made by Berlin artists. The highlight was a video of a guy blowing up a raft with a tube connected to an accordian that he played. Then we went to the German national museum for a retrospective on Berlin art during the Cold War. There was a bunch of stuff, some of it explicitly commenting on the division of Germany, and others more abstract. My favorite was the Literature Sausage made by an artist who would shred books by authors he disliked, add spices and wrap the pieces up on sausage casing. Finally we chilled out at this little coffee shop with a pig for a logo, where over the speaker a woman sang "Comfortably Numb" by Pink Floyd in German. All in all a good day. Pictures soon and more fun tomorrow! *"I've platz-ed myself" and "I almost platz-ed myself" have become my go-to comedy phrases for the time-being. **One of them had nutcrackers. I was delighted to learn that the German word is Nusseknocker, or Nußeknocker if you're feeling sassy. Last night we went out of the house, pretty much for the first time since I've been here. We went to two places. Henne - was a cozy restaurant where they primarily serve fried chicken. Sounds a little funny, but actually is was very classically German. The inside had a great looking bar area and lots of wood, kind of that winter lodge feeling. Apparently it's one of the older restaurants in Berlin, but it's casual. The Chicken was excellent! We each had a half chicken. And the potato salad was cold and delicious, filled with mayonnaise-y flavor. Some Trendy Bar - forgot the name of this place. Actually I never knew it because it was the kind of place that doesn't go out of its way to tell you what it's called. This trendy bar had cocktails and a cool decor inside. It was full of hipsters and easily could have been transported to the US without me noticing. Would recommend. I finally made it to Berlin yesterday. Today I am trying to work, but I am fighting jet-lag pretty hard. The period right after lunch, where I'm full of food and it's 6am or whatever in Pittsburgh is always the hardest part of my day. I planned that time to read a paper, but that may have been a mistake. I am having to fight very hard to stay awake. Lame parts: It's snowing here... and cold. So the weather is actually kind of worse than in Pittsburgh. Cool parts: I was bumped off my flight and put on a business class ticket one day later. I think that was the first time I've ever flown business class across the ocean, when it actually matters. Definitely nice, but probably not worth ten times the cost of a normal ticket, which is what I believe it normally costs. Also, there are a bunch of cool little restaurants near-by with soups and things, and a bunch of neat coffee kaffee shops too.